All prices include: transfers, accommodation, meals, guided activities and cold weather clothing; all as listed. This holiday includes wonderfully unique activities that will leave you full of amazement, all the while situated in a charming, secluded location. Snowmobiles, huskies and Northern Light hunts provide you with a full array of excitement that will be hard to match anywhere else! Pine Bay Lodge sits in a beautifully secluded and charming location, on the shore of a lake and surrounded by tall pines. During this 4-night stay, you’ll embrace all that Sweden has to offer. Experience a multitude of exciting activities such as dog sledding and snowmobiling as well as wonderful Northern Lights opportunities. This four night holiday to Pine Bay Lodge has been created as a relaxing opportunity for you to explore the remarkable landscape of the Luleå Archipelago whilst enjoying some serious Northern Lights opportunities. This myriad of small islands can be found on the east coast of Sweden and offers guests a unique landscape of pack ice and forest-covered islands. Along with the beautiful natural features of the area, there are also many exciting activities which can be enjoyed alongside the comfort of the cosy lodge. 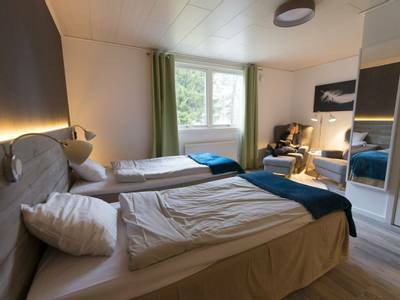 Your base will be the homely and hospitable Pine Bay Lodge, a classic Swedish-style lodge located close to the coastal edge of the archipelago, around 30 minutes from Lulea. The lodge has a traditional relaxed feel and the charming lounge area with its large open fire is the ideal spot to relax in after your adventures. Our holiday has been purposely designed to provide a balance between scheduled activities and free time for relaxation whilst maximising Aurora potential. You will enjoy a variety of activities, including dog sledding, snowmobiling, ice fishing and two Northern Lights hunts. Luleå is lucky enough to be a region which enjoys frequent displays of the Northern Lights and some of the staff here at Aurora Zone have witnessed truly unforgettable displays from the terrace here at Pine Bay. Upon arrival at the airport*, you will be greeted and transferred to your accommodation at Pine Bay Lodge. On the way to the lodge, you will get the first glimpse of the archipelago and the surrounding pack ice. At the lodge, there will be time for you to settle into your accommodation before enjoying a welcome dinner. This is the ideal opportunity to get to know your fellow travellers and also enjoy your first taste of some of the Swedish specialities. Following dinner, there will be an introductory meeting with your guide who will discuss your upcoming activities with you and provide you with the cold weather clothing that will be yours for the duration of your stay. You can then sit back and relax on one of the sofas in front of a roaring fire. Don't forget to take a walk out onto the terrace, though, as the Northern Lights frequent the night skies here on a regular basis. A note on flights: flights are not included in the holiday price so that the best possible fares and schedule can be found at the time of booking. There are low cost and scheduled flights operating on this route and our travel experts will happily provide a quotation and arrange the flights as part of the package. The first day of your adventure in Luleå includes two of the most thrilling activities that Swedish Lapland has to offer: snowmobiling and dog sledding. Following a full safety briefing and tuition, you will head out travelling two people per snowmobile for a two-hour safari through the frozen forest. A favourite pastime of the locals, snowmobiling in this region takes you through incredible scenery and gives you a great introduction to your new surroundings. Along the way, you will stop for hot drinks – the perfect way to recharge your batteries. Back at the lodge, you will enjoy lunch and then have time to rest and refresh before heading out for an amazing husky safari. Travelling by dog sled is an exceptional way to see the landscape and allows guests to enjoy a real adventure. It is an activity that is almost universally popular with visitors and with good reason. Once the dogs' initial excitement has abated (they love nothing more than to run) they will settle into a steady pace, allowing you to appreciate the magnificent beauty of the region. You will be out for around two hours in total (including transfers) and will travel two people per sled. There will be the opportunity for you to swap over so you can take it in turns to drive the sledge. A warm drink will also be served en route. Following your exhilarating day in the snow, you will have some free time to relax back at the lodge. You may want to take a walk through the surrounding forest or make use of the relaxing sauna (charges apply), prior to enjoying a sumptuous meal tonight. Today you will have the day free to enjoy as you see fit. Perhaps head out on another snowmobile excursion, or enjoy the sauna at the lodge? You can even choose to venture out on an exhilarating hovercraft experience across the frozen archipelago, which is a truly amazing experience. Please see our 'Personalise' section for full details. Tonight, you will set out for your first Northern Lights hunt. Sitting in a snowmobile-pulled sledge, you will be nestled on reindeer hides and covered in blankets, as your guide leads the hunt for the Northern Lights. During the search, you will stop for your wilderness dinner, which your guide will cook over an open fire as you scour the sky for the Aurora. After a fun-filled couple of days, today you can take a more relaxed approach and enjoy a morning of ice fishing. Using a snowmobile-pulled sleigh, your guide will take you to the best location for fishing. You will be shown how to drill through the ice and your guide will give you some hints and tips on the best way to attract the fish. Warm drinks are included during the activity. Following lunch back at the lodge, you will have the afternoon free to relax and unwind. Perhaps sit by the fire, or maybe enjoy the sauna – please see our 'personalise' section for full details. After a final dinner in the lodge, tonight you will take part in a Northern Lights snowshoe hunt, travelling through the forest, with your expert guide discussing the flora and fauna of the area. Snowshoeing makes inaccessible areas easy to reach and you will be able to explore deep into the winter wonderland. Hopefully, the Northern Lights will also make an appearance for you tonight! Today you will say goodbye to this remarkable landscape as you are transferred to the airport for your flights home. Alternatively, you can choose to extend your stay with a night at the incredible architectural wonder that is the Treehotel. Please see the 'Personalise' section for more information. 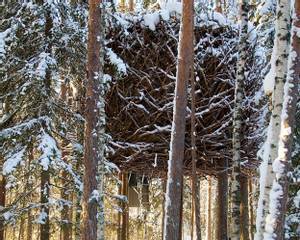 The lodge is located on the coastal edge of the Luleå Archipelago offering views across the frozen sea and surrounding snow-clad forests. There is minimal light pollution here, resulting in the night sky producing stunning displays of the Northern Lights if conditions are right. 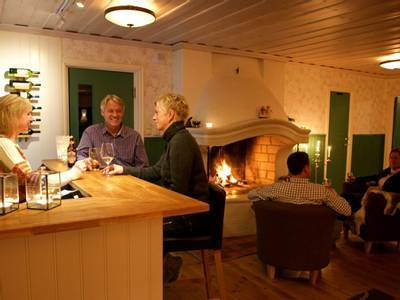 The words homely and charming immediately spring to mind when describing Pine Bay Lodge (Furufjärden in Swedish). It offers a ’home from home’ style of accommodation, which is comparable to that of a ski chalet. Pine Bay is the kind of place that makes you feel like you want to curl up by the fire and relax with your slippers on; highly recommended after a day of adventures. 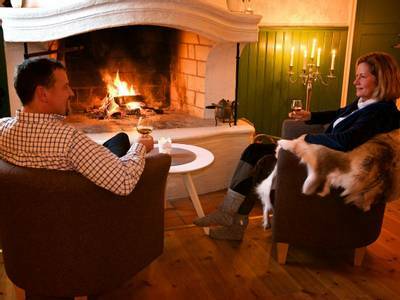 Our good friend Göran Widén, who owns the lodge, recently told us: "If I come into the lodge and find someone fast asleep on the sofa in front of the open fire, it is the ultimate compliment. For people to be so relaxed and comfortable in the lodge shows I have been successful in creating the atmosphere I had in mind when dreaming of how I wanted my guests to feel during their holiday." A sauna is available to book locally and we do encourage all guests to enjoy the traditional roll in the snow afterwards. This will help you understand the real meaning of the word refreshing! The lodge has only eight guest bedrooms in the main building, all with en-suite shower rooms. There is also a family suite of rooms in a small annexe adjacent to the main building. You really could describe this as an ‘exclusive destination’. The rooms are very comfortable and provide a peaceful place to lay your head after a day of adventures. The Treehotel is unique and surreal. 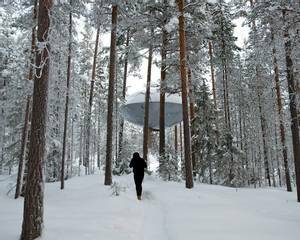 We can arrange for you to spend the night amidst the treetops of Swedish Lapland in one of the most inventive bedrooms on the planet. It is an experience, unlike any other and one that we don't feel that you should miss. Each of the seven architect-designed rooms is cutting edge. The bedroom options include The UFO, Mirror Cube, Bird's Nest, Blue Cone and The Cabin. Each room is spectacular in its own right and totally unique and no matter which option you choose you will experience an unforgettable night. It is possible to upgrade to a night in The Dragonfly or the 7th Room - please ask if you would like a quote for this option. Your stay includes lunch, dinner and breakfast at Britta's Guesthouse which is approximately a 10-minute walk from the tree rooms. This is a characterful and quirky place to dine, in contrast with the ultra modern Treehotel, with old world charm and hearty home cooking. This is exclusive accommodation as there are only six rooms, so we recommend booking as soon as possible to avoid disappointment. In the morning after your breakfast, your transfers will be arranged to take you back to the airport for your return flights home. Please contact us for a full quotation based on your transfer and rooming requirements. This region is the only place we feature where guests can explore the wilds in a hovercraft. These machines perfectly suit the ever-changing seasons here and are exceptionally good fun. You will each be given an intercom headset in order for the pilot to be able to communicate with you and impart his local knowledge. During this two and a half hour tour, you will set off across the ice and islands and head out to the island of Brändöskär which is typically close to the edge of the frozen sea. You will disembark and take a walk on the ice where depending on the weather conditions, you may witness some of the vast natural sculptures which form as the pack ice gradually shifts and cracks. A light lunch is included and you will be served warm drinks before returning to the lodge. The frozen sea is a sight to behold. A vast, thick sheet of shimmering white, stretching out far into the distance, it is hard to believe that the ocean lies below. The ship then cuts through the ice with apparent ease and suddenly the water is revealed. Shards of Ice surround the boat and you would be forgiven for wondering whether you are on an expedition to Antarctica. 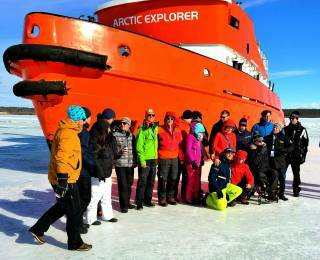 The title of the ship ‘Arctic explorer’ conjures up images of historic voyages and when you get out onto the open ocean it is difficult not to feel a sense of adventure. 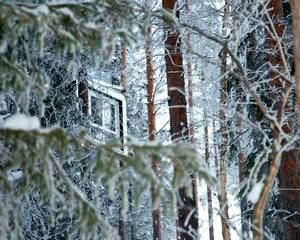 You will take a 35-minute transfer to Luleå from your accommodation at Brändön Lodge or Pinebay Lodge, before picking up a second transfer from Luleå to Piteå, which takes approximately 50 minutes. Following an introduction and safety briefing by the ship’s captain, the journey will begin in Pitsundskanalen, which is where the mouth of the river Piteälven meets the open sea. A mere 100 yards ahead of this point, the ocean opens out and there is a seemingly endless display of ice, which is easily broken by the ‘Arctic Explorer’. The ship leaves a trail of ocean behind and this makes it possible to bathe in the freezing water. You will be given survival suits which will provide protection from the cold and also prevents you from getting wet. Following this, you will have the opportunity to float on the water. It is an invigorating experience, and when you are lowered into the ocean you may have feelings of trepidation, but this soon replaced by delight. You can also experience walking upon the thick Ice of the frozen sea, which is a surreal experience, particularly if you imagine the contrast of a summer’s day, where the water is flowing freely. A hot drink and survival suits are included. If you would like to, you can choose to drive your own snowmobile for the duration of the two-hour forest tour snowmobile safari. Sit behind the controls for the entire safari as you glide over the snow and ice, savouring the beauty of the surrounding landscape. The sauna at Pine Bay Lodge sits a short walk from the main building, jutting out over the edge of the frozen lake. If you would like to experience authentic Swedish relaxation then why not book yourself a trip to the sauna? Flights are not included in the holiday price so that the best possible fares and schedule can be found at the time of booking. There are low cost and scheduled flights operating on this route and our travel experts will happily provide a quotation and arrange the flights as part of the package. Single adult price: based on single room accommodation only (transfers are shared). Should you wish to drive your own husky team or snowmobile please ask our Travel Experts for a quotation. The minimum age for participation in our itinerary is 8 years old, however, for some activities and transfers, you may be joined by other guests and this may include some of a younger age than stated. Any younger participants will be fully supervised and the guides will ensure that their participation takes place only if the activities will be unaffected. To drive a snowmobile, you must have a full driving licence and be over 18 years old. To travel on a snowmobile (as passenger or driver) guests must also be a minimum of 140cm tall.